Times Square, 47th St. and Broadway, New York. Ongoing since Sept. 9, 2013. Residents, Wall Street Workers, media professionals, and tourists from around the world stop and ask questions. Dr. Wang Bingzhang (王炳章) was among the first Chinese sent overseas by the Chinese government to study science and technology in late 1970s when Deng Xiaoping opened up China. He was the very first Chinese to obtain a PhD (in medicine) when he graduated from McGill University in Canada in 1982. Upon graduation, he announced that he would devote himself to a democratic movement to change China. He founded the first overseas democratic league, and worked with activists overseas as well as inside China in the pre-Internet era. In 2002, he was kidnapped in Vietnam by the Chinese government, and in 2003, he was sentenced to life in prison (New York Times‘ coverage). He has been kept in solitary confinement since. 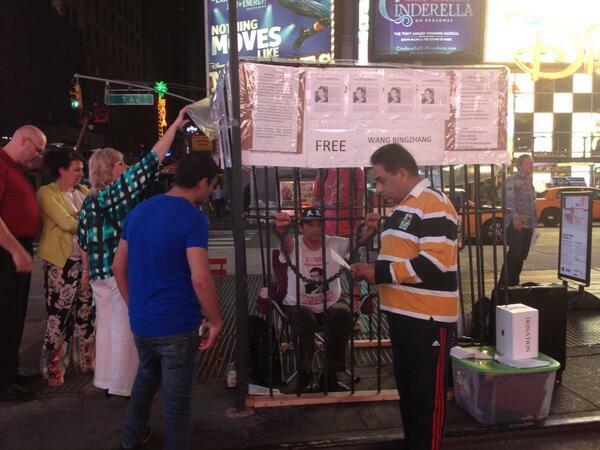 On June 27, the 11th anniversary of his kidnapping, his family launched a global campaign to free him. As part of the campaign, Dr. Wang Juntao (王军涛), a leader of Chinese democratic movement overseas and a leader of the 1989 democratic movement in Beijing, has staged a protest called “In Prison with Dr. Wang Bingzhang” to demand the release of Dr. Wang. On September 15, the International Democracy Day, a large demonstration will be held in front of the Chinese Consulate in New York. On October 7, a 7-day hunger strike will commence in front of the UN to demand investigation into Chinese government’s inhumane treatment of Dr. Wang. Wang Mei, sister of Dr. Wang Bingzhang: 1-650-521-1774, Dr. Wang Juntao: 1-347-705-3789. To learn more about Dr. Wang Bingzhang, visit wangbingzhang.org, website maintained by his youngest child Ti-Anna Wang (王天安). 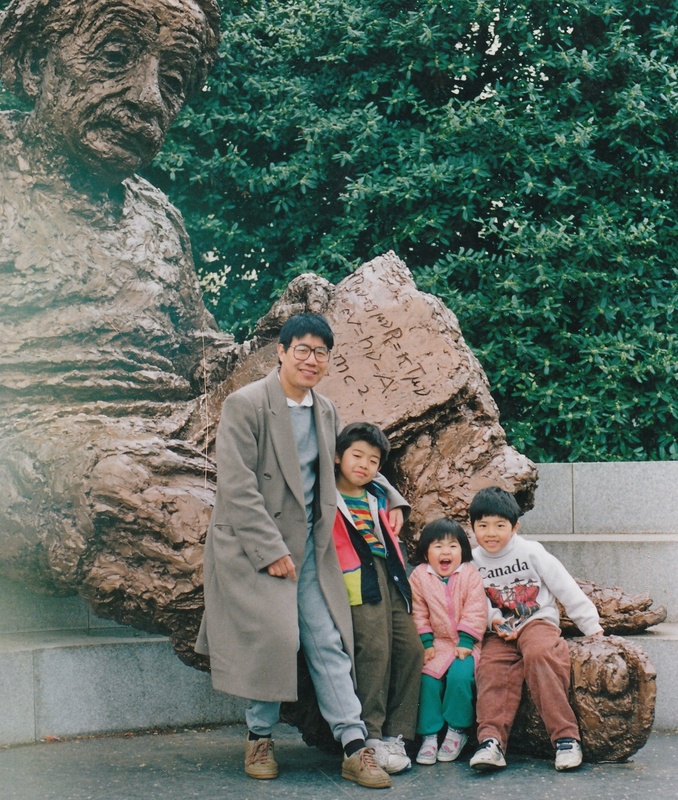 Dr. Wang with his three children. 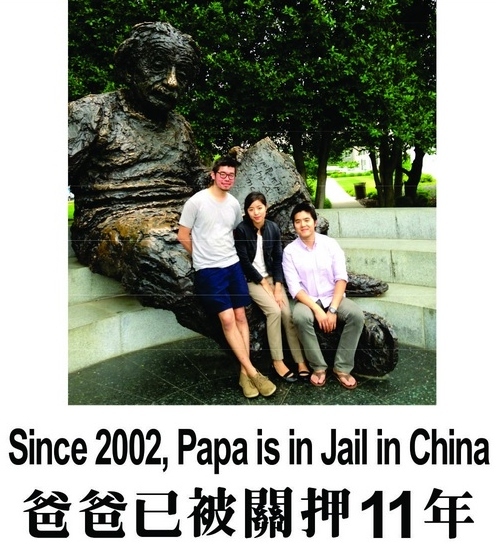 Dr. Wang’s three children, now grown, on the same spot. By China Change in Human Rights & Civil Rights, Reports on September 14, 2013 .